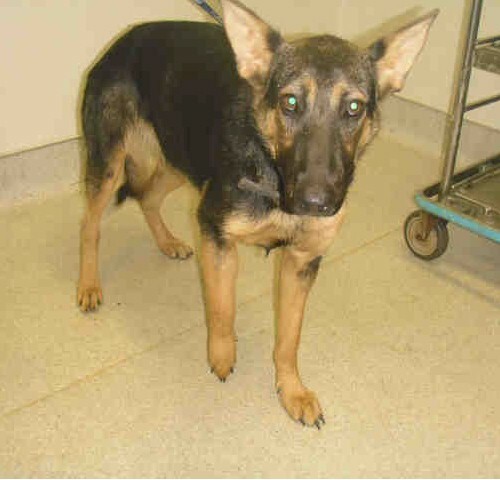 Catalina is a very sweet and pretty black and tan young lady, just around a year old. She came into the Modesto pound as an unclaimed stray with a badly broken leg, most likely after being hit by a vehicle. Thanks to our Rainbow Fund, she had a plate put in on 7/20/10 and has healed up very nicely. She never let the injury slow her down much at all, she just held it up out of the way, ran and played with the other dogs in her first foster home. She is a little on the timid side, she didn't have a lot of exposure out in the world before she came to us. She's very sweet with people she knows, and gets along appropriately with other dogs. She can be timid in new situations and is just a bit shy with people she doesn't know, but she's becoming more outgoing all the time. She's good with small dogs and cats. Catalina is looking for a low-keyed home where she can continue to be socialized and gain in confidence without being overwhelmed. No after pictures of this little cutie, just the shelter picture with her poor swollen leg!